Double walled house 24 cm thick walls with no pillars . The interior of the house is 375 m2 and there is a 150 m2 covered veranda on 3 sides.There are 3 bedrooms and an office area . 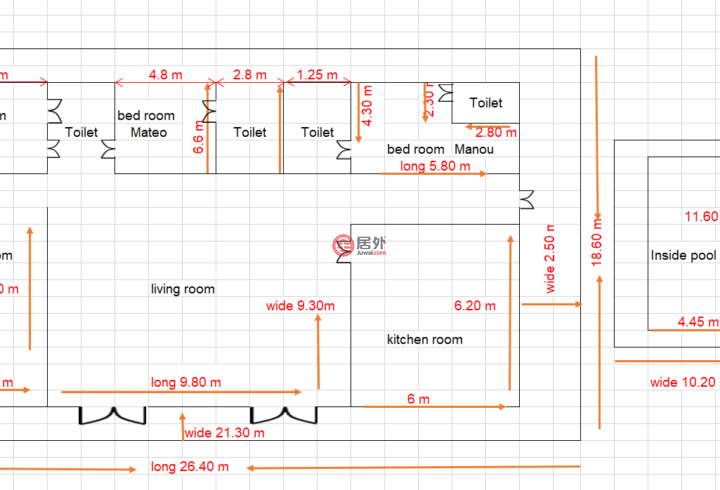 3 ensuite bathroom + a guest toilet . Guard quarter with bedroom , Laundromat room and storage room . 100 m2. desjoyeaux swimming pool 4 m. x 10 m with night lights, and a sun deck of 35 m2. 35 m. deep bore well , grundfos pump , 2000 gallon storage with water softner and filtration system . The water is potable . Double glazed UPVC windows with UV protection. VRV2 Daikin in ceiling air conditioners - LED lighting indoor and outdoor . Bosch alarm system. Stable electricity with own transformer 100 KVA with private cabling from main road. Independent satellite internet connection . Mosquito netting.